Matrox Graphics announced that the Matrox C900 is now available for purchase. The Matrox C900 is a single-slot, PCI Express x16 graphics card that drives nine displays at resolutions of up to 1920x1200 @60Hz per output. Designed to power 3x3 or 9x1 video walls, C900 delivers one ultra-large desktop across all attached displays, ideal for digital signage, presentation and video wall applications. 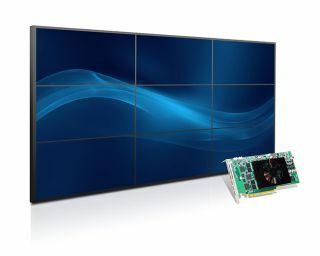 A special-purpose card designed to power 3x3 or 9x1 video walls, two Matrox C900 cards can be combined to create 6x3 or 3x6 video walls from one system, with the board-to-board framelock feature ensuring all displays are synchronized to reduce tearing. The C900, with its reliability, performance and low-power consumption delivers a cost-effective video wall solution for enterprise, industrial, pro A/V, digital signage, security, control rooms and more.